Fear and anxiety over going to the dentist is a common problem and one that causes numerous people to avoid seeking dental treatment. The sounds and pressure of the drill, needles, the fear of pain can all create a negative impression of the dentist. Laser dentistry is growing in popularity, allowing you to get the treatments you need in a less invasive manner. At Giri Palani DDS, FICOI, we offer laser dentistry with Waterlase. Lasers have been used in the medical field for a few decades now, performing all kinds of tasks from vision correction to removing blemishes on the skin, and even in many types of surgical procedures. 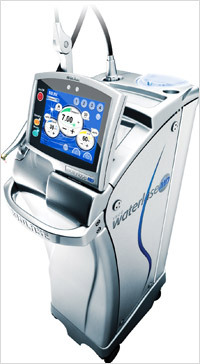 Waterlase is a special dental laser that is designed to improve the quality of your oral care. This particular laser was developed by BIOLASE Technology, a company leading in the dental laser industry. It uses patented technology that uses a combination of YSGG laser energy and water spray, a process called HydroPhotonics. • Removal of tooth decay. • Preparing teeth for fillings. Waterlase can more accurately target damaged areas of your teeth, leaving healthy areas of the tooth completely intact. • Preparing teeth for other restorations. • Dental cleanings. The laser can be used to remove tartar buildup from below the gum line. • Soft tissue treatments. The laser takes the place of the traditional scalpel, performing procedures such as crown lengthening, gum contouring, and gingivectomy. • Removing growths in the mouth. Waterlase lasers use a combination of laser energy and a spray of water. The laser generates a concentrated beam of light, which is sent through an optical fiber to the hand piece. We aim the hand piece at the areas that require treatment and are providing you with pinpoint accurate treatment. During your treatment, we will provide you with a pair of special glasses that will protect your eyes. • Pain-free. The laser is the only thing that comes into contact with your tissues, and are much gentler. They do not vibrate against the teeth or generate heat or pressure. • Less bleeding during your procedures. The laser cauterizes your tissues as it cuts, significantly reducing the amount of bleeding you experience during your treatment. • Reduced recovery period. Patients who have undergone treatment with Waterlase tend to recover quicker than those who have undergone treatment with a scalpel or drill. • Reduced risk of tooth damage. A drill can cause fractures to your teeth. Even if they are tiny, they can still be damaging. The laser does not cause these same issues. • Less pain and swelling while recovering. Scalpels cause a significant amount of tissue trauma, which often leads to a significant amount of pain and swelling while you heal. The laser provides pinpoint accuracy and can cut your soft tissues in a way that greatly reduces this tissue trauma, reducing the pain and swelling you feel as you heal. • Less anxiety. The sound of the drill, the pressure, the post-procedure pain, and swelling can all create fear and anxiety over going to the dentist. The laser eliminates these issues, increasing your comfort in the dentist chair. If you are interested in learning more about Waterlase or finding out if it is right for you, contact Giri Palani DDS FICOI today at (310) 894-8301.